Mary Pat Kelly weaves historical characters such as Maud Gonne, William Butler Yeats, Countess Markievicz, Michael Collins, and Eamon de Valera, as well as Gabrielle Chanel, Gertrude Stein, James Joyce, and Nora Barnacle, into her new novel Of Irish Blood, a vivid and compelling story inspired by the life of her great-aunt, and the sequel to her best-selling and critically praised novel Galway Bay. As an author and filmmaker, Mary Pat Kelly has told various stories connected to Ireland. 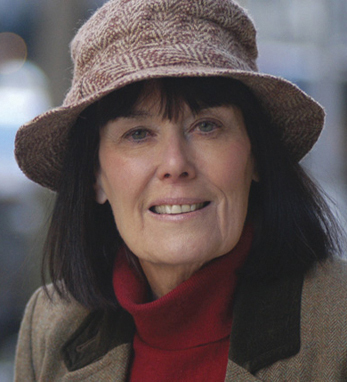 Her award-winning PBS documentaries and accompanying books include To Live for Ireland, a portrait of Nobel Peace Prize winner John Hume and the political party he led; Home Away from Home: The Yanks in Ireland, a history of U.S. forces in Northern Ireland during World War II; and Proudly We Served: The Men of the USS Mason, a portrayal of the only African-American sailors to take a World War II warship into combat, whose first foreign port was Belfast. She wrote and directed the dramatic feature film Proud, starring Ossie Davis and Stephen Rea, based on the USS Mason story. She’s also written such books as Martin Scorsese: The First Decade and Martin Scorsese: A Journey; Good to Go: The Rescue of Scott O’Grady from Bosnia; and a novel, Special Intentions. She is a frequent contributor to Irish America magazine. Mary Pat Kelly worked in Hollywood as a screenwriter for Paramount and Columbia Pictures and in New York City as an associate producer with “Good Morning America” and “Saturday Night Live,” and wrote the book and lyrics for the musical Abby’s Song. She received her Ph.D. from the City University of New York. Born and raised in Chicago, she lives on Manhattan’s Upper West Side with her husband, app developer Martin Sheerin from County Tyrone.